It gives me great pleasure to welcome Ruchi Vasudeva to MBB today. 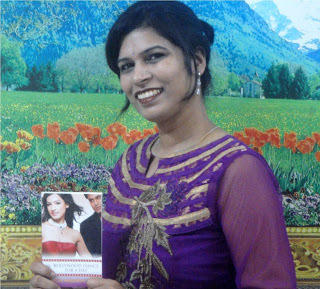 Ruchi is the author of the brand new Indian HM&B novel BOLLYWOOD FIANCE FOR A DAY. At the moment, it's available only in India, but we hope it will be available internationally very soon. How does it feel to be a Harlequin Mills and Boon author? Great. Fabulous. Gorgeous. *smile* There are really no words to describe the feeling of being published and even less when it's with a world renowned publisher like Harlequin. HMB is the leader in romance genre and it's wonderful that they are giving opportunity to the Indian writers to come forward via the Passions contest. Winning this contest was a pivotal point in my writing career which finally led to the snapshot moment when I could actually hold my book in my hand. It was extremely thrilling. As you are a doctor, would you like to write medical romances? Yes definitely. For one thing I won't have to do the research! I have had to do a lot of it for the Bollywood background in my book though the heroine is a doctor so some medical part does creep in. For some reason my muse has been concentrating on Bollywood stories but when the right one strikes me I'd love to write a medical. Used to enjoy reading those a lot, especially the ones by Sonia Deane. How did you feel when you saw your book cover for the first time? I absolutely loved it. I was in such a hurry to see it. Cue me reading the email that the book cover had been sent and then being unable to open the attachment in my phone! I could hardly breathe as the laptop started up and was in a tizzy till finally it was revealed. But have to say it's more than I could've imagined. Really grateful to everyone involved. Hmm I'll try. Here goes : "Seeking distraction, she dates a brash Bollywood star, not knowing that a glimpse into his human side will only deepen her troubles." Writing and more writing. :) My second book, that is Vishakha's sister's story, will be out in December. I have a short featuring in an anthology to be published by Harper Collins India by the year's end. I'm working on a couple of ideas, let's see which pans out for next manuscript. Hopefully, the ebook version will be available internationally soon. Hi Maria. Congrats, Ruchi, on your book release. Why is it that the computer/mobile phone freezes up just when you need it to work? I could so relate with your situation. :D Good luck with your writing! It's my pleasure to host you, Ruchi. Great to see you over here, Helen. Hi Maria - great interview! Living so far away from India, we crave stories from India and especially Bollywood. So looking forward to reading your story! Congratulations! Congratulations on the publication of your book, Ruchi - I'm really looking forward to reading this, so I hope they hurry up and make it available in the UK soon. Thanks, Helen! Great to be part of it :) I'm over the moon over the cover, glad you like it too! Hi Nas, it's true so many people love Bollywood and as a fan I just love to write about it :) Thank you!